“One man’s efforts to keep his pet tortoise warm likely caused an early morning fire on the city’s Northwest Side. The owner of the tortoise says the animal knocked over a heat lamp inside his wooden shelter, causing the fire outside the home on Village Gate, near Les Harrison Drive and Culebra Road, shortly after 12 a.m. 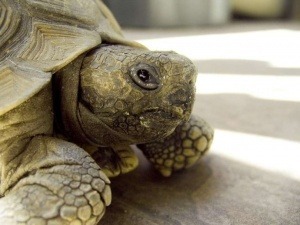 The 15-year-old, 120-pound tortoise, named Bits, suffered some burns to his shell, but was otherwise okay. The flames spread to a house next door, causing extensive damage. The family inside that house was burned out. They were not hurt.